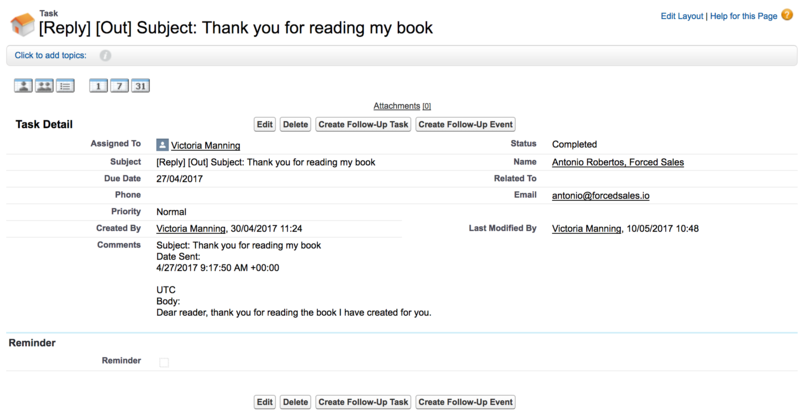 Here's how to synchronize your inbound and outbound emails data between Reply and Salesforce accounts correctly (in just 6 simple steps). You can set up the integration between Reply and Salesforce to automatically send emails from your Reply account to your Salesforce account. Use this option when you want to see in-campaign emails directly from your Salesforce interface. Reply can synchronize both outbound emails and inbound emails to Salesforce and display them in the form of tasks for a particular contact or lead. For more information on how to set up the integration between Reply and Salesforce, see the following article. Log into your Reply account. Open the Integrations page, select Salesforce and click Configure. In the Steps section, click Add sync step. In the Add sync step dialog box, select Emails (Reply) to Contact Tasks (Salesforce), or Lead Tasks. 6. Toggle the Activate slider on. After you have set up the integration, all inbound and outbound emails for the contacts (leads) will be displayed in the Salesforce interface. Note: Reply does not synchronize the out-of-office and auto-reply emails. Reply uses predefined mappings for this type of synchronization. You cannot change them manually. Open the Leads (Contacts) tab. Under the Name column of the Recent leads (Recent contacts) section, select a lead/contact you want to see emails and open it. Scroll down to the Activity History section to see emails related to this lead/contact. Open any email to view its details.